Coil forms are used to hold a specified number of turns on a specified diameter former. The coil form may or may not be used in conjunction with a coil form "tuning slug". A tuning slug in a coil form leads to greater inductance with fewer turns. Very good examples of coil forms surrounded by metal shields are the I.F. cans in AM / FM Radio Receivers. Coil forms are used to hold a specified number of turns on a specified diameter former. The coil form may or may not be used in conjunction with a coil form "tuning slug". A tuning slug in a coil form leads to greater inductance with fewer turns. Very good examples of coil forms surrounded by metal shields are the I.F. 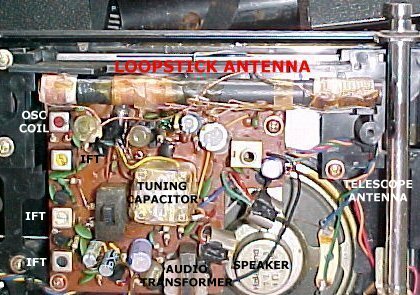 cans in AM / FM Radio Receivers as in figure 1 below. The shielded coil forms are indicated by "OSC" for the oscillator inductor and the "IFT" cans are the IF transformers tuned to 455 Khz. These shielded coil forms used as the IF transformers (IFT) probably have something like 140 turns wound on the primary which is a relatively tiny coil form and would yield an inductance of around 680 uH at a reasonable "Q". Some other examples of these coil forms with and without the metal shield are in figure 2 below. "photo courtesy of Coilcraft" with appreciation of their generous support. These coil forms are numbered from 1 through 5. Number 1 is a coil form with a tuning slug (often called a "screw core" or "threaded core") and surrounded by a "cup core" to give increased inductance. By screwing the tuning slug in and out we are able to get wide variations in inductance. One example of these type of coil forms, sometimes also called "variable inductors" might be a former and cup core combination which produces say a nominal inductance of 68 uH per 100 turns over the frequency range of 1 to 10 Mhz. Number 2 could simply be number 1 enclosed in a metal shield (copper) to prevent interaction with adjacent components. 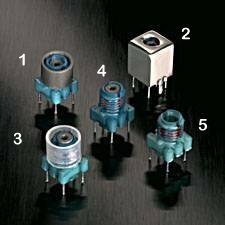 Number 3 simply has a plastic cup core to protect the windings, it would have a dramatically reduced value of inductance in the absence of a magnetic cup core. Numbers 4 and 5 have no cup cores at all. I'm not even certain number 5 has a screw core. These are simply a few examples of the hundreds of sizes and possible variations available. ADDED - 28/1/13: Our friend Harry Lythall - SM0VPO has a particularly interesting page for "DIY IF cans for valves". As always, it shows Harry's creative and imaginative talents. Worth reading as well to get ideas.